The mango tree (Mangifera indica L.) is primarily cultivated for its edible fruit, which is one of the most important fruit crop (FAO, 2011). 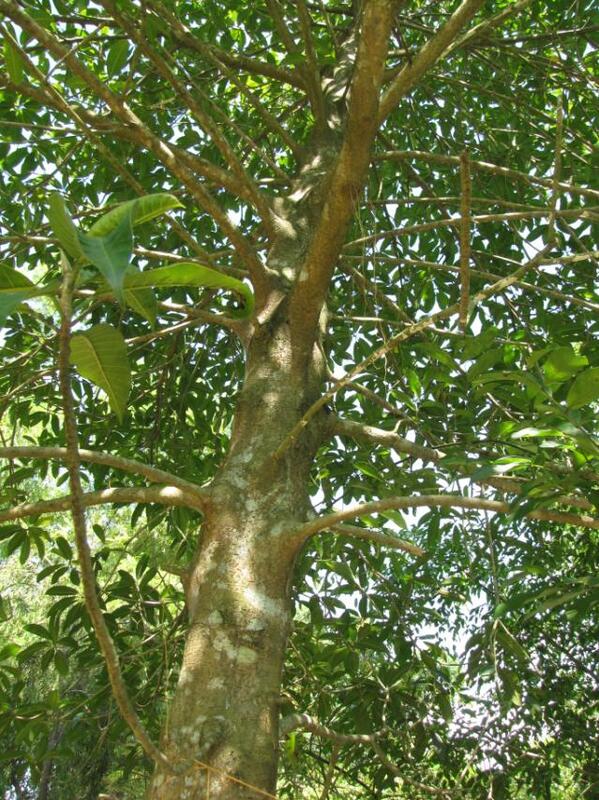 While not usually considered as a forage tree, the mango tree also provides forage for animal feeding. 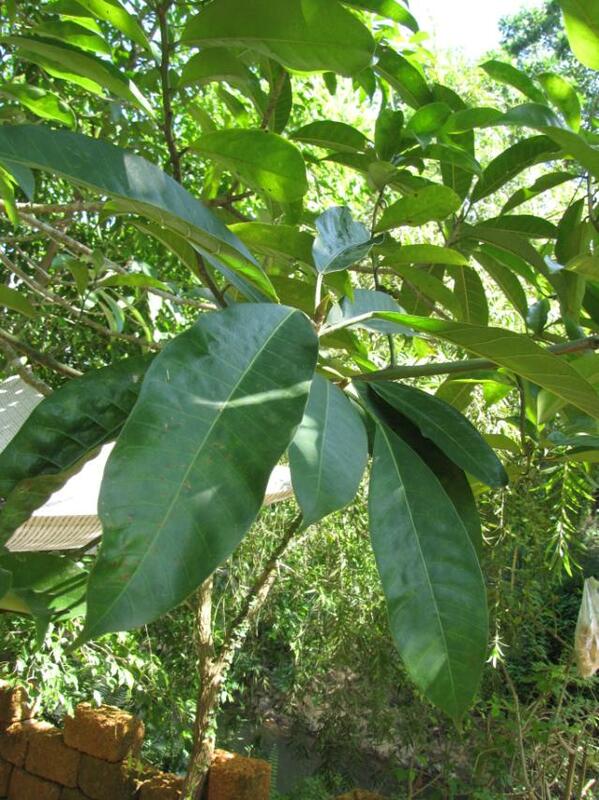 The mango tree is an evergreen tree of varying size and shape. It has a deep taproot and profuse surface roots (Litz, 2009), a stout trunk (90 cm in diameter) and an umbrella-shaped crown that may reach 20-40 m high (Orwa et al., 2009; Litz, 2009). The leaves are simple, alternate, borne on 1-12.5 cm long petioles. Leaves are 16-30 cm long x 3-7 cm broad on flowering branches and up to 50 cm long on sterile branches. Young leaves are orange-red and turn shiny dark green on the upper surface when they mature. The edges of the leaves are somewhat wavy. Mango tree flowers are fragrant, pentameric, greenish-white or pinkish, very small (3-5 mm long x 1-1.5 mm broad) and densely borne on 30 cm long, pyramidal panicles (Litz, 2009; Orwa et al., 2009). The fruit is a large fleshy drupe of very variable size, shape, colour and taste, with a woody endocarp (the pit), a resinous edible mesocarp and a thick exocarp, the peel. The fruits bear a characteristic beak at the proximal end of the fruit (Litz, 2009). Green when unripe, the fruit turns orange-reddish as it ripens. The fruit takes between 3 and 6 months to ripen. The seed can be found within the pit. 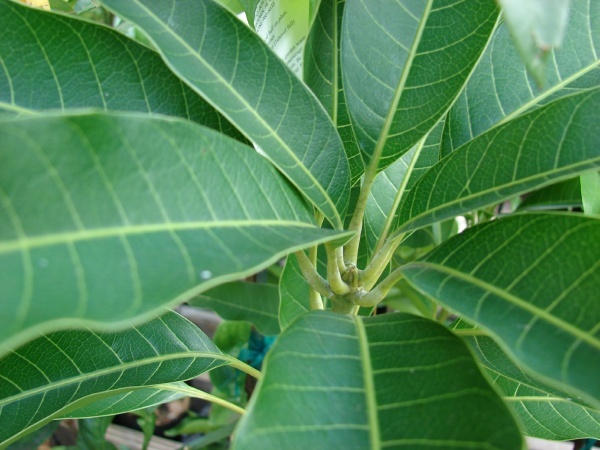 Mango tree foliage is available year-round. It can be used as fodder, either as cut-and-carry or browsed (Ajayi et al., 2005). The leaves of some varieties may smell like turpentine when crushed (Göhl, 1982). Mango leaves are also used as mulch (Orwa et al., 2009). This datasheet is about mango foliage: for the fruit, see the Mango fruits and by-products datasheet. The mango tree originated from South-East Asia and has been cultivated in India for several thousand years. It spread throughout South-East Asia about 1500 years ago and then to the east coast of Africa 500 years later. It was further introduced to Australia, West Africa and then to the Americas. It is now widespread in tropical and subtropical areas between 30°N and 25°S (Orwa et al., 2009; Sukonthasing et al., 1991). It can be found from sea level up to an altitude of 1200 m but commercial cultivars will be fully productive below 600 m. Optimal growth conditions are an average day temperature ranging from 24 to 30°C, annual rainfall between 750 and 2500 mm with a marked dry period for fruit induction, full-sun exposure on deep, well-drained and poor soils with a pH ranging from 5.5 to 7.5. 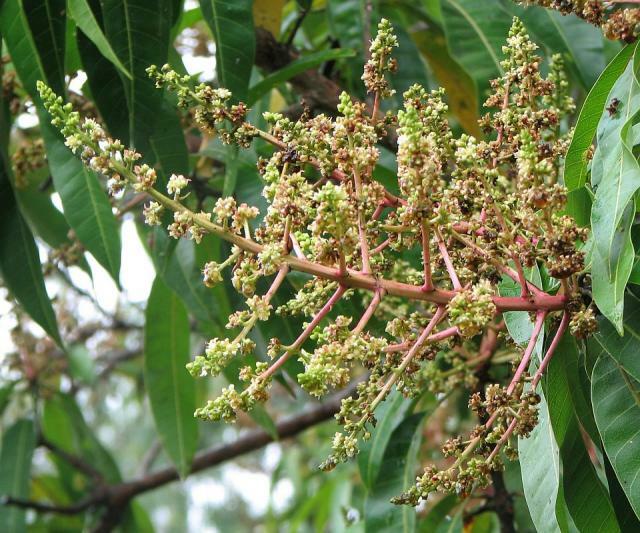 Mango trees are tolerant of water stress (drought or flooding conditions). In the subtropics, it can survive frost but young shoots and flowers are killed at temperatures ranging from 4° to 12°C, depending on the cultivar. Fruit production will be hampered if the frost comes too late in the season. Mango will not stand acidic or saline soils (Orwa et al., 2009; Sukonthasing et al., 1991). Mango leaves used as mulch can help to restore saline soils in coastal areas. Finger millet grown on saline soil treated with mango leaf mulch yielded 20% more than untreated finger millet crop (MSSRF, 1994). The profuse foliage of the mango trees provides shade to humans and livestock. Mango leaves increase the organic matter content of the soil below the trees (Orwa et al., 2009). Mango leaves are readily browsed by livestock (cattle and small ruminants). Fresh leaves have a relatively high DM content (30-50%) with a crude protein content ranging from 6.5% to 17% DM and NDF content ranging from 20% to 50% (Feedipedia, 2011). The lower protein content cannot sustain animal requirements and mango leaves should be supplemented with other feeds (Ogunbosoye et al., 2010). Large amounts of mango leaves should not be fed to livestock due to mangiferin toxicity (Lowry et al., 1992). Mango leaves contain very small amounts of saponin, which may be an advantage to ruminants: saponins reduce ruminal bacteria, thus decreasing protein degradability and methanogenesis (Daodu et al., 2009; Francis et al., 2002). Mango leaves contain high levels (7% DM) of mangiferin, a phenolic compound. Mangiferin may cause poisoning of cattle if mango leaves are fed in large amounts. In India, cows used to be fed mango leaves because mangiferin is degraded into euxanthic acid, a rich yellow pigment used in paints, which was excreted in urine and collected. However, because continuous intake of the leaves could be fatal to cows, the practice was outlawed in 1908. Sporadic cases of death caused by mango leaves have been reported (Orwa et al., 2009; Lowry et al., 1992; Morton, 1987). However, later haematological investigations on goats fed on mango leaves revealed that they were safe to goats (Ajayi et al., 2005), which is not consistent with the toxic effects observed previously (Lowry et al., 1992). Mango leaves are palatable and acceptable to ruminants, though their toxicity is disputed (see Potential constraints above). While mango leaves compare favourably with young cockspur grass (Echinochloa crusgalli) when they are offered as the sole roughage to goats (Akbar et al., 1991), comparisons with other plant species are generally less positive. Mango leaves can sustain 6.4 g daily weight gain in goats when Leucaena leucocephala results in 54 g daily weight gain (Kibria et al., 1994). Apparent digestibility and N retention observed for mango leaves are also lower than for other plant species (Daovy Kongmanila et al., 2009; Ikhimioya, 2008). When growing goats are given the choice, mango foliage has the lowest DM intake (0.3% BW) compared to shrubs and fodder trees such as Erythrina variegata (0.9% BW), Ficus racemosa, jack tree (Artocarpus heterophyllus), jujube (Ziziphus mauritiana), kapok (Ceiba pentandra) or bamboo (Bambusa vulgaris) (Daovy Kongmanila et al., 2009). Since goat selectivity is thought to be correlated with feed nutritive value, mango leaves should be considered as a low quality feed, which may be due to the presence of stems in mango foliage (Daovy Kongmanila et al., 2008). Mango leaves are better used when associated with other forages. Supplementing mango foliage with water spinach (Ipomoea aquatica) increases DM and CP intake, apparent digestibility and N retention in goats (Daovy Kongmanila et al., 2009). Mango foliage may also be profitably used as supplement in forage-based diets: in goats, it enhances total DM intake and overall animal performance when offered as a supplement in a Guinea grass/concentrate-based diet. It compares favourably with Gliricidia sepium or Ficus thonningii in such diets (Ajayi et al., 2005). Mango leaves are not very palatable to rabbits (Aduku et al., 1989). However, they are a safe and valuable fodder for rabbits and can be used during periods of scarcity (Jokthan et al., 2003). They can be used as an alternative source of crude fibre in pellet-based diets: they have a positive effect on overall DM intake and crude fibre digestibility (Jokthan et al., 2003; Demeterova, 1998).